Make your own delicious organic kombucha right from home. so easy and it saves money! Store bought kombucha is $3 or more per bottle. 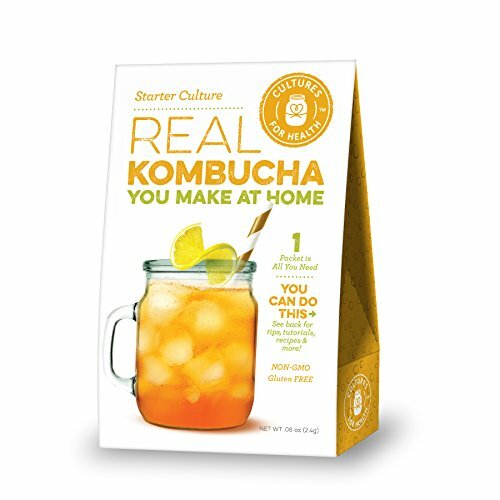 When making kombucha using our starter culture you can brew your own kombucha for less than $2 per gallon. Kombucha starter consists of a yeast and a bacteria which exists in a symbiotic relationship (SCOBY). When you combine it with a sweetened tea and ferment it for around 7 to 30 days, the kombucha ends up having a slight carbonated zingy taste and is infused with B vitamins. 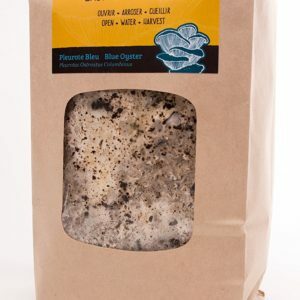 Every box comes with one dehydrated, live kombucha starter culture (this is commonly known as a SCOBY or mother) as well as 10 pH strips. Dehydrated kombucha cultures are very easy to use, will stay safe during shipping, and will rehydrate easily in 30 days. 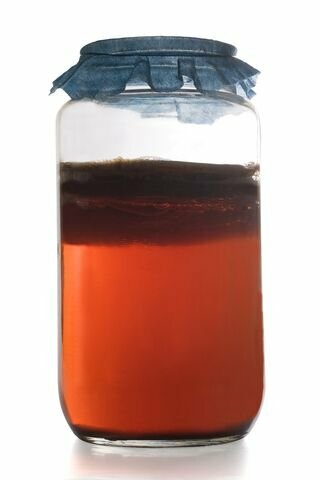 Kombucha cultures are reusable and with the proper care, they can be transferred to a new batch to keep your brew going! Just a few ingredients will be needed: Simply add your tea, sugar, vinegar, and water to get it going. 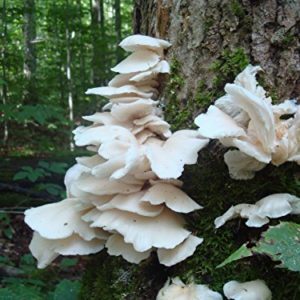 The first batch will require a 30-day culturing time period; subsequent batches will be ready in 7-30 days. Kombucha starter ingredients include: Organic black tea, Organic sugar, active live cultures. 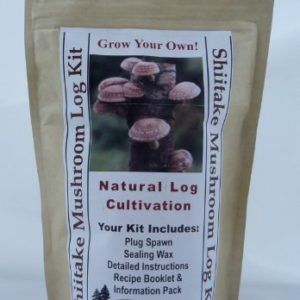 Non-Genetically Modified, free from gluten and dairy, as well as vegan. 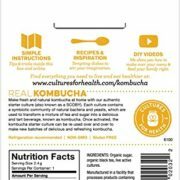 Allergen Info: Cultures for Health Kombucha Tea Starter Culture is free from gluten (less than 5ppm). 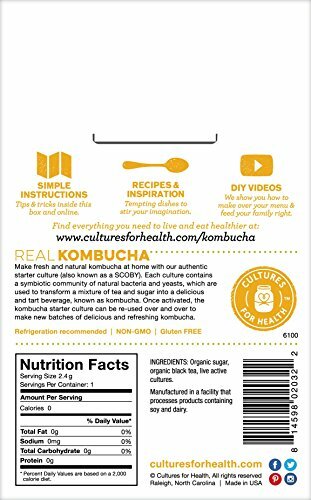 Cultures for Health Kombucha Tea Starter is made in a facility that produces products containing dairy and soy. All lots are tested by an independent lab for for gluten content (below 5ppm) We also test for pathogens to make sure we are providing a safe product for our customers. 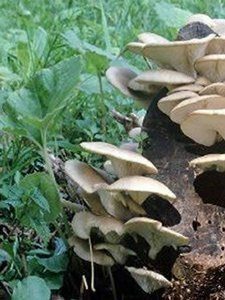 Kombucha you can make easily at home! 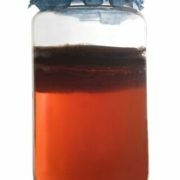 Every culture (SCOBY) is reusable and can be used to brew multiple batches – one is all you will ever need. 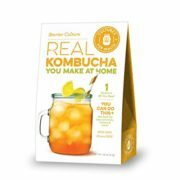 Make kombucha right from home for $2 a gallon or less. Free from gluten or dairy, vegan.